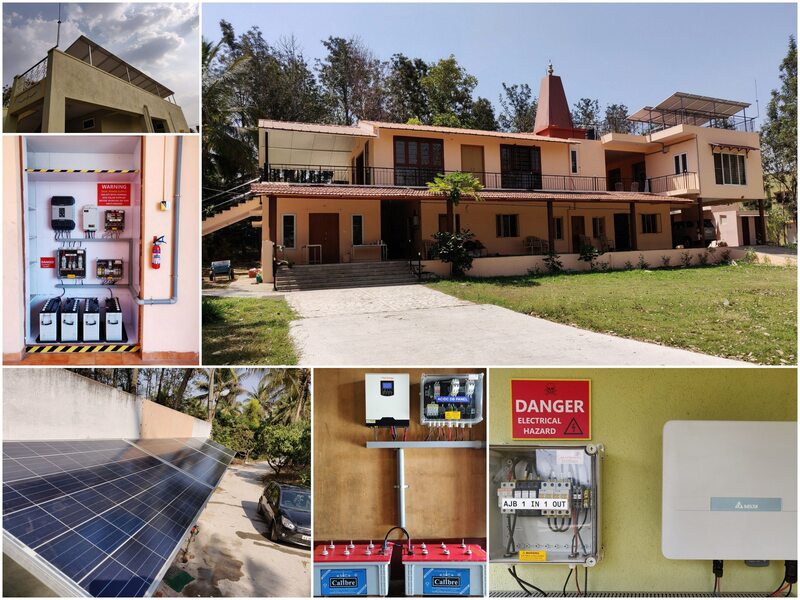 Over the last three weeks , we installed and commissioned three Rooftop solar systems , each of a different topology at three different building rooftops at Ramakrishna Yogashrama near Bangalore . The system consists of 1. A Hybrid system with net metering at the main building and prayer Hall. (Self Consumption plus full backup plus excess energy exported to the grid) 2. A Grid tied system with net metering at the Student hostel Block . (Self consumption and excess energy exported to grid) 3. An Off-grid System at the Goshala building . (System totally independent of the utility grid) . The Project was mostly funded by the Ashram themselves . But a good amount of money was funded by our customers and well wishers . We thank all our customers and friends who believe in our vision and have always supported us in good initiatives.